Didn’t I tell you I was going on a bolero kick? I wasn’t kidding. Here’s my most recently completed one, and I have another well under way, and trying to plan another. 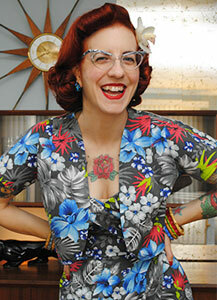 Sometimes I make a sewing or knitting plan and never execute. But sometimes I do! My second finished bolero of the year is a completely different shape than my first one, and feels like wearing… well, like wearing a chic blanket. It looks chic, but is mega comfy, and with all the extra fabric in the batwing sleeves, it feels like you’re wrapped in a lovely blanket! 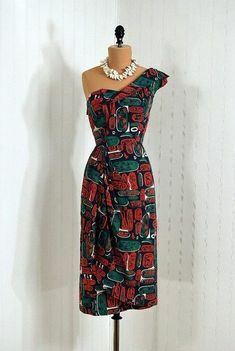 This was made from a 1950s pattern from Etsy. 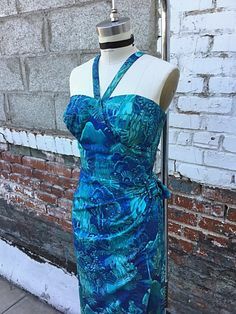 I won’t lie: I dislike that the seller included the original photo from the pattern but didn’t include any information on what publication it came from, and re-typed the pattern. Clearly that didn’t bother me enough to not purchase it, but I still would much have preferred the original thing. So that being said, you can find it by searching for 1950s cross over bolero on Etsy, but I’m not linking to it as those minor facts bug me. 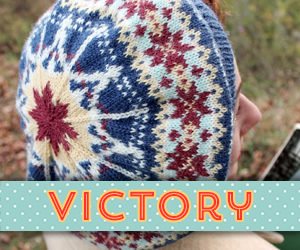 I fell in love with the pattern photo and only realized it had a completely wacky construction once I started reading through the pattern. 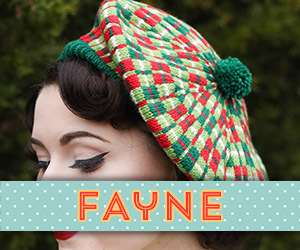 This was unlike anything I’d ever knit! You knit two halves the same but mirrored (not the weird part), and then you graft them up the center back. Get a load of this! This is one half blocking—well technically two halves as I blocked them on top of one another as I didn’t have enough mats. Is that funky or what?! 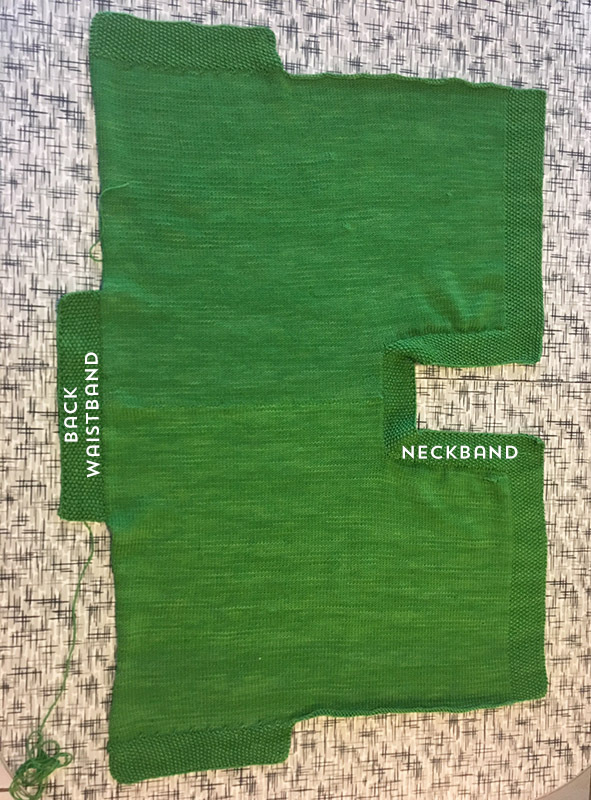 Here’s how this works: the two long edges get seamed together to form the underam seam, but you don’t sew the entire lengths together. First, you graft both halves together, and it looks like this below. This is just before I wet the graft at the center back to relax the stitches, so it’s not as noticeable. At this point, I realized I could theoretically knit it all in one piece, but instead of all the neck stitches being on hold, they could be cast on or bound off, or provisional cast on and put on a holder. Also, this was literally the size of our kitchen table. I was so worried this thing was going to be huge! But it did all work out in the end. Batwing sleeves take up a looooot of space apparently. After I knit the neckband (but before the back hem band), I folded the front bands down and at that point you can kind of see it starting to make sense! All that was left at this point was knitting a 12″ band at the bottom in the very center, which forms the back waistband. 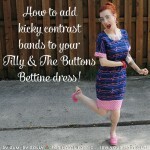 And voila… it actually does all turn into a kickass bolero! 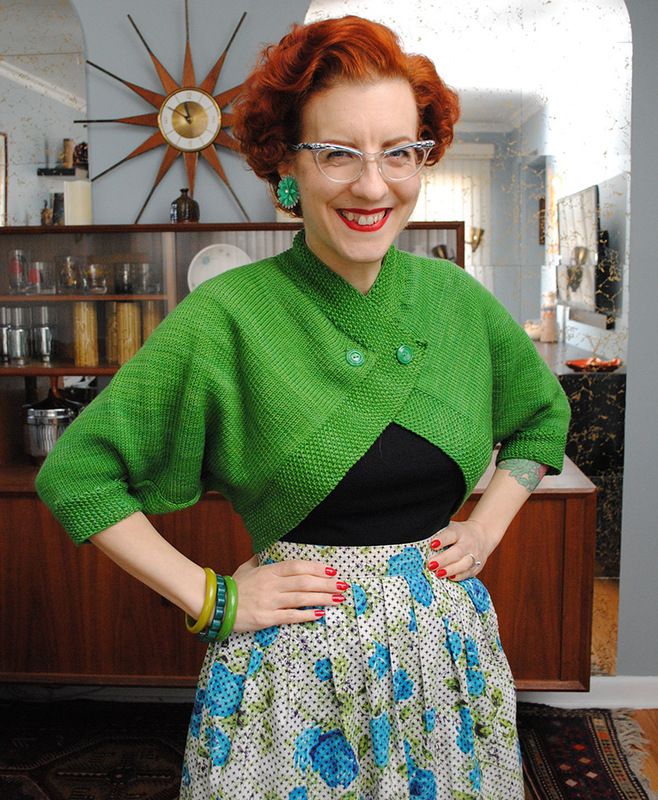 The yarn is Wollmeise Merino DK in Erbse, the perfect green for spring, and I love it with my red hair. 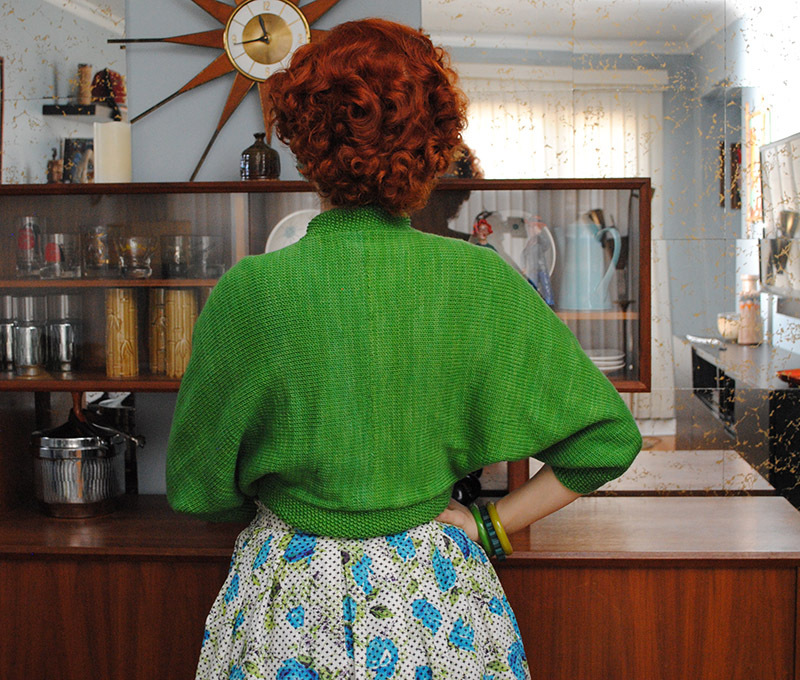 This actually isn’t even the first bolero I’ve knit in Wollmeise DK in green, ha ha! This one is, four years ago. 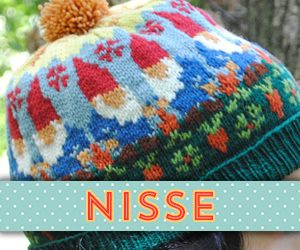 It’s one of my favorite yarns to wear in cool-but-not-freezing weather, so it’s the perfect yarn for spring and fall. It has a nice smooth feeling as you knit with it, and on the body, nearly reminiscent of cotton without the harsh in-elasticity of cotton when you knit (I personally can’t stand knitting with cotton). Here’s the back view. Drama sleeves! Drama sleeves! I love it. Now there’s one thing that’s a little bit goofy about the bolero due to the construction. 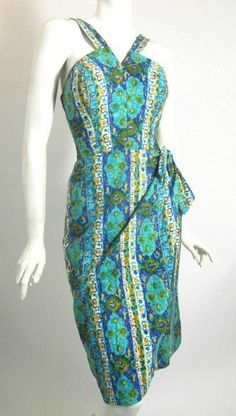 Because you essentially twist the front down to meet the underarm, that seam then in turn kind of twists around your arm. And not as if I’d stand like this a lot, but in the photo below you can see it most clearly on my outstretched arm, and that the cuff seam is nearly at the center point of my elbow. It’s more of a noticeable seam than I was expecting, especially the twisting bit. That being said, when I more closely examined the photo from the pattern, it was noticeable there, too! It bothered me at first, but several people on Instagram pointed out that they actually thought it looked like a design element that mimicked the curve of the bolero and shaping on the front. I like that way of thinking about it. You can kind of see that below. And after wearing it for two days straight I’m inclined to agree! It certainly hasn’t prevented me from enjoying it. When I first tried this on last week when I finished it, I thought the seam would prevent me from wanting to knit this again. I think I’m changing my mind about that. I’ve also contemplated other ways to construct this that would alter where that seam was positioned, but pretty much every option is pretty wacky too, and I’m not sure it would be that much better, anyway! I actually wore this with three different outfits in two days and loved everything about it. It went with a skirt (like shown), it went with a dress, and it went with jeans. I may just need to go ahead and knit another! Perhaps with a small stitch pattern, which might also make the seam less noticeable? I’m not sure yet. But a red one, or an aqua one? I need to check my closet. Or, as someone on Instagram suggested, in winter (like, next winter), a black one with rhinestone buttons for fancy outfits! 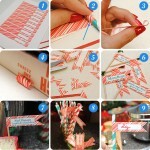 Loved that idea! Then again, black is still always a good accessorizer color for me so maybe black for spring too, ha ha! Goodness knows I adore my Carbeth in black. 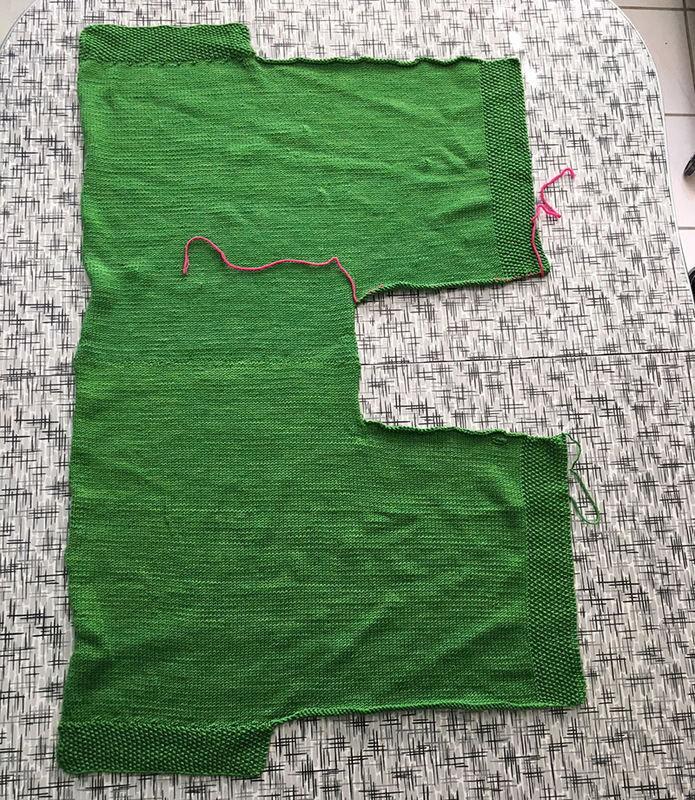 I love the seed stitch edging and think it’s clever that you pick up and knit the back edging on only in the center back, and seam it to the front edging that’s knit along with the front in one one the pattern. You can juuust see where that seam is at the small of my back. The one thing about knitting such an unusually constructed garment is that it left me with no opportunity to tweak the fit. I mean really, I had no idea how it was going to even come together until about halfway through! So I had to trust it would work, and that it would fit. That is not a feeling I normally have with knitting, which was both a bit disconcerting and kind of refreshing at the same time. 🙂 In the future, at least now I know how it’s assembled so I could make minor changes if I wanted. 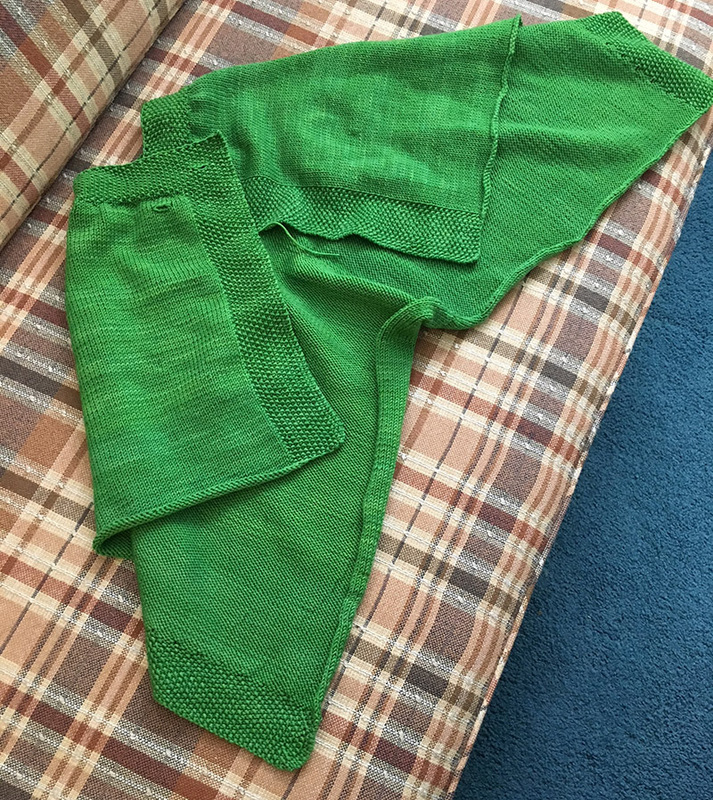 Technically, I’d often knit a size 12 in a vintage pattern but the smallest was a 14 in this pattern (14, 16, 18). I figured one size in this kind of style wouldn’t make much difference, and I was right. I’m perfectly happy with the fit of this. 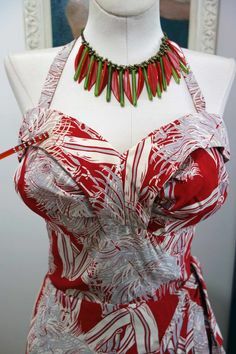 And you can really play with how you want the neckline to close… a little higher or lower. I used two vintage buttons and larger buttonholes than the pattern, but even placing the buttonholes as directed, the corner edge was flipping out so I added a hidden snap at the very edge. I think this would be a great pattern for two statement vintage buttons, too, but these were the only ones I had matching in green and I wanted to wear it NOW! All in all, I’m enamored with the shape! 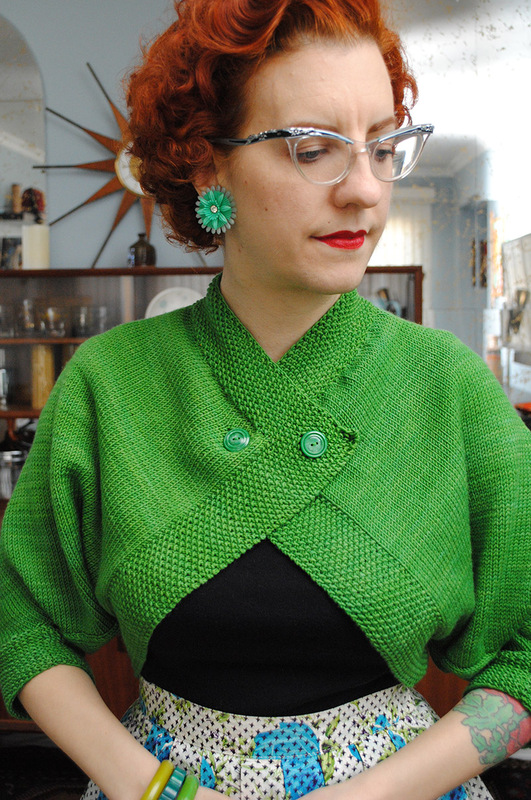 This is a really fun piece and I’m happy to have such a gorgeous new bolero in one of my favorites shades. I’m always in the mood for green but I’m extra in the mood for green when it’s about to be spring! Thanks, Susan! 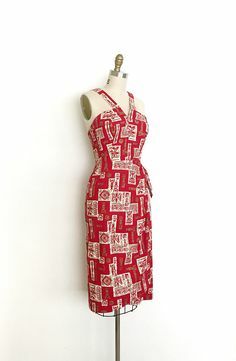 I absolutely think with some minor construction changes (or maybe not even) you could do this with knit fabric– I actually thought about the same thing! It’s so eye-opening seeing it all laid flat like that, gives you a lot of ideas! 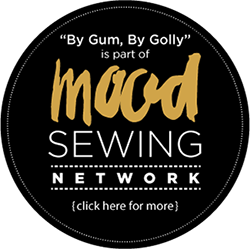 So glada to hear the modification on that pattern worked for you, it’s one of my all-time favorites!! Absolutely stunning! Even though the shape is unusual it looks quite elegant. I admire your perseverance even though you were unsure how things were going to go together. Very inspiring. 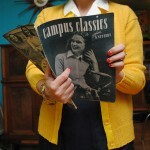 I check for your posts regularly as I both knit and sew also. 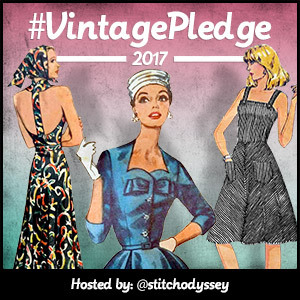 Love your vintage style and makes! It always makes my day brighter to discover you have added something new! This is wonderful and I absolutely adore the beautiful green. You are an inspiration to me. Brilliant pattern. I can see why you got it despite your misgivings. I love the shape of this bolero and you did an amazing job! 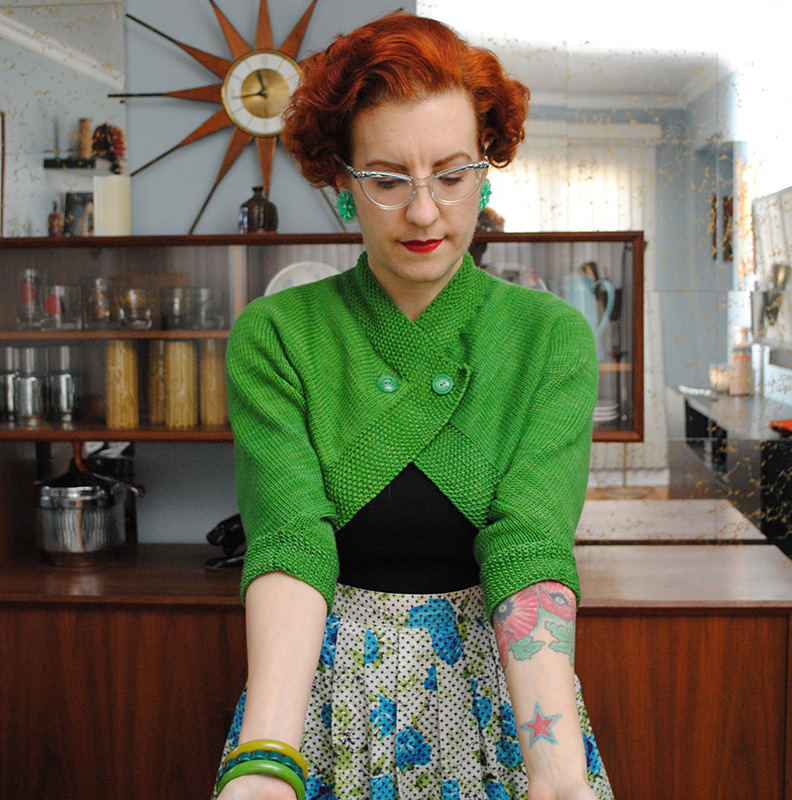 I can not knit to save my life, wonder if this shape could be used to make a sewn bolero. Yes! Susan also commented on that above. 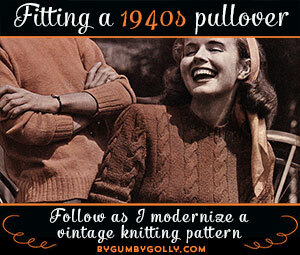 I think it could easily be adapted somehow to work with knits! Perhaps just a trial run with some yardage of a cheap knit to play with. What a lightening fast project, except probably working out the bands. 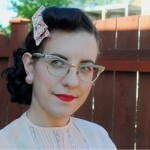 And I guess mitering those upper corners… I’m sure there’s a tutorial out there on how to do that for knits! I think it would be stellar! I may have to try it at some point too, ha ha. 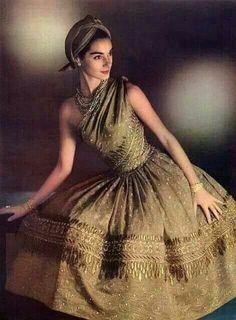 It is a stunning garment. I can picture a version in a dark shade, maybe with a carved wooden pin for the fastener…. ooh the possibilities 🙂 Is it very snug around the neck? No, the neck isn’t snug at all! And you can adjust it so that it’s tighter or looser. I went a little looser than the pattern I’d say (just going by the photo) and it’s completely comfortable. That green is a fabulous color on you! I love the unique design. Thank you! Yeah the design is really interesting! 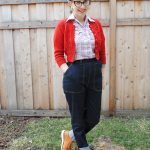 UGHHH your knitting posts kill me! I’m so scared to make the transition from sewing to knitting, it just seems so hard and so slow and so many new things to learn! I have so many wasted Australian Home Journals with knitting patterns that I will never use.. But the end result is absolutely incredible and that green is perfect for you. Colour me jealous! That is fabulous! It’s one of those garments where I’m torn between marvelling at the design or how cosy it looks. 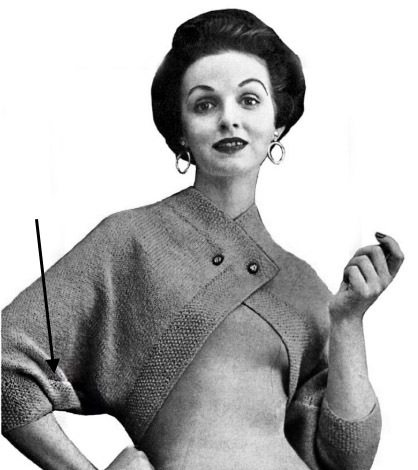 I do love knitting mid-century patterns with interesting construction – it’s fascinating to have that insight into the brain of the designer and to see how they took the idea and made it a reality. 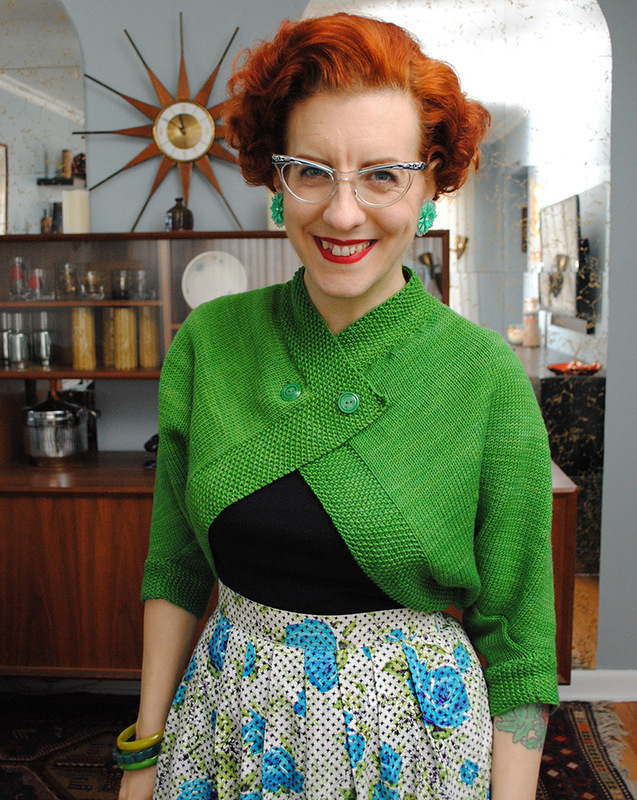 I just finished knitting a re-issued design from 1945 with ruffle details and the way the vertical ruffle was inserted was absolutely bizarre and yet logical at the same time. Enjoy your lovely new bolero! Thank you! Yes, as I was going along I often marveled at how interesting such an unusual construction it was! 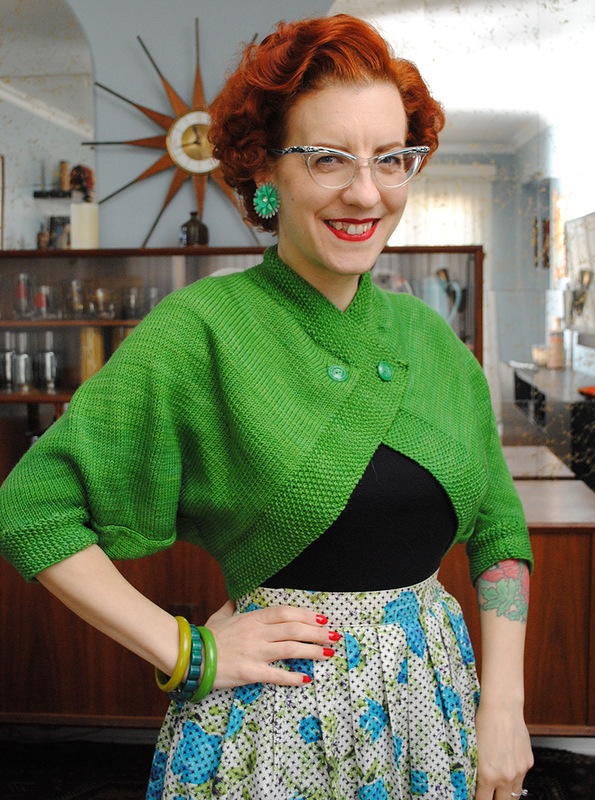 I have another 1950s bolero pattern I’m working on that ends up with a somewhat similar body shape, but with a *completely* different and also rather unusual construction! Wow, that construction is making my brain hurt, but I love the end result! 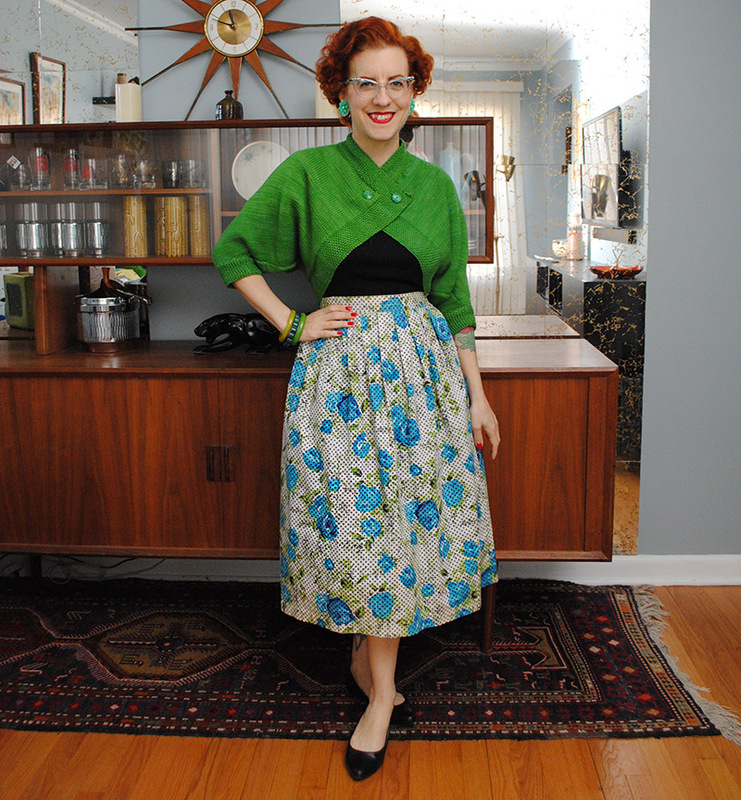 I really love it, and I love the skirt’s shape too… tea length but with a somewhat undersstated volume it seems? and i totally second the suggestion of making a black one with rhinestone buttons… I think it could work in light colours too actually. 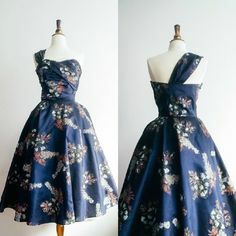 And if you do add a stitch pattter it could really look awesome with the different directions of the fabric if the pattern is small enough I think…. This is a great piece of work! 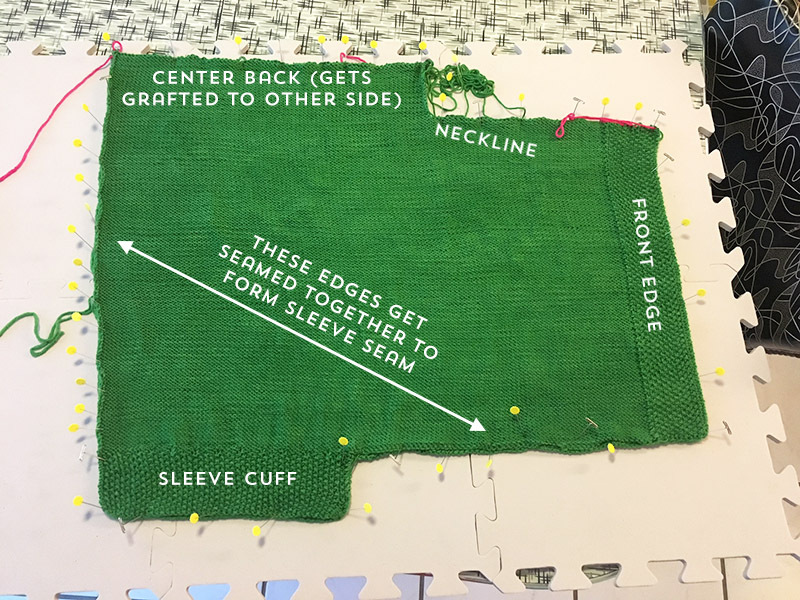 I wish more sewing patterns had such an easy layout with this stylish result! The 2 pieces actually make sense to me. I’ve been knitting for (omg…) a few decades, and my work always shows ‘direction’. A single-piece construction would probably not be so beautifully symmetrical. Nice work on the back seam! 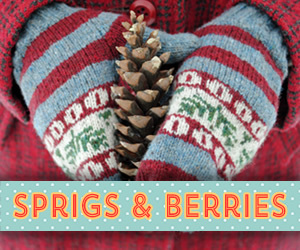 Happy knitting/stitching! I love everything about this! 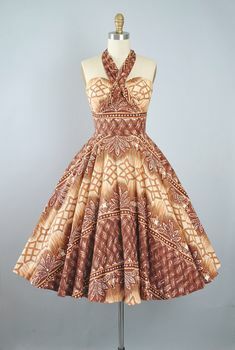 I think I may actually have this pattern in my etsy favourites or one very similar. I now feel a *need* to make one of these, yours is SO GOOD!